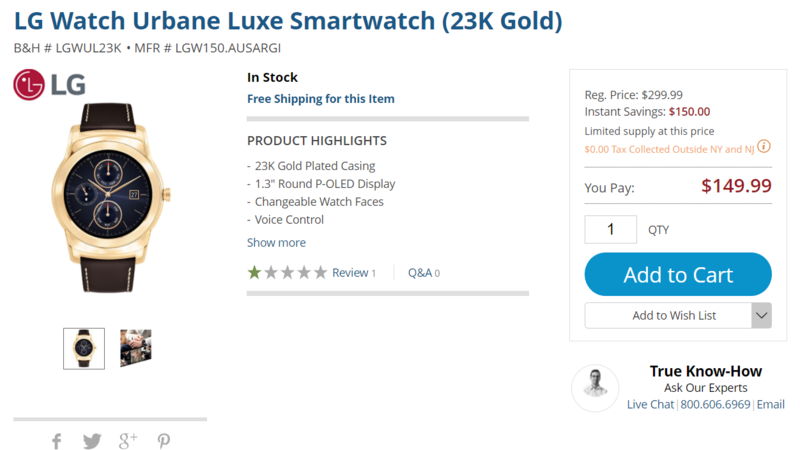 Some of the reviews for the watch specifically mention that what B&H is selling is missing the alligator band and deployment clasp, so I really doubt it is the official "Luxe" version, but rather the 23k plated Luxe body on the standard band from the rose gold model. Given the price, I entirely understand. I have found that alligator is pretty expensive stuff in my amateur leatherworking, and a single skin can run you quite a lot at high-grade qualities. The LG Urbane is one of the few Android Wear devices I have personally used, and I found it to be pretty excellent. Unfortunately, I was much more interested in my now-defunct Pebble Time Steel, but I can confidently say that the Urbane was the best Wear device I ever used. Our review came to the same conclusion, but it is very much worth remembering that even if it did just get Android Wear 2.0, it originally came out in 2015.